At the Thouy hamlet, you can relax in the pool, enjoy a game of tennis or take a stroll. There are also plenty of other activities in the Sidobre area as well the rest of Tarn. Walking, riding, cycling - tourist information can be downloaded. Welcome to 'La Gorge' This three bedroom gite sleeps 6 people. 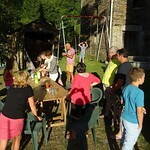 A Gites de France 3 épis (3*) gite with 1 Queen sized bed, 1 double bed, 1 bunk bed. Shower room with separate toilet. La Gorge is a detached cottage on the edge of a forest with panoramic views of the Agout Valley. This cottage is architecturally typical of the 'Haut-Languedoc' style. It has a big outside staircase and a large courtyard complete with a barbecue area and comfy garden furniture. Its ground floor once housed farm animals, which helped to warm the first floor living quarters. The gite comprises a large open plan fully-fitted kitchen, living room and dining room an enclosed courtyard with comfy garden furniture, also private barbecue. Welcome to the 'L'Oustal' is a charming gite in the heart of the Tarn's 'Sidobre'. This three bedroom gite sleeps 6 people. A Gites de France (3*) gite - 2 double beds, 1 bunk bed. L'Oustal is the former family home, where several generations of Thouy's were born and raised. The interior is typically 'Haut Languedoc' in style and still has the original, integrated kitchen sink. The living room has a large fireplace and built-in cupboards. This cottage benefits from two terraces, one of which is walled-in. The gite comprises fully equipped kitchen - living room - dining room - shower room - toilet - wood burner + electric heating - children's games, two terraces - comfy garden furniture - private barbecue. Welcome to the 'Le Frêne' This two-bedroom gite sleeps 5 people. A Gites de France 3 épis (3*) gite - 1 double bed, 3 single beds. We recently installed an internal staircase and completely refurbished the shower room and fully-fitted kitchen. The gite comprises an open plan fully-fitted kitchen/living room, a shower room with separate toilet, a wood burner, electric heating and a covered terrace. Comfy garden furniture - private barbecue - parking and free satellite Wi-Fi. Welcome to the 'La Vallée' This three bedroom gite sleeps 6 people. A Gites de France 3 épis (3*) gite - 2 double beds, 2 single beds. A former barn and outhouse, La Vallée is our most recent conversion. It combines a rustic charm with all mod-cons and is constructed with local materials - granite, schist, slate, as well as chestnut and Douglas Fir wood on both the interior and exterior of this lovely cottage. It overlooks the swimming pool, tennis court and the stunning Agout Valley. The gite comprises of : an open plan fully-fitted kitchen, living room and dining room, bathroom, toilet with washbasin on the ground floor, a wood burner and electric heating. Private terrace, comfy garden furniture, private barbecue - parking and free Wi-Fi. This two-bedroom gite sleeps 5 people. A Gites de France 3 épis (3*) gite - 1 double bed, 1 bunk bed, 1 single bed. Le Cerisier is a bungalow with a large courtyard that's slightly set apart from the other gites. It's on the edge of a forest and benefits from a beautiful view over the Agout valley. This gite was once a barn used to store straw and hay. The gite comprises a large open plan fully-fitted kitchen, living room and dining room. A shower room with separate toilet. A wood burner and electric heating. A large, private courtyard, comfy garden furniture, private barbecue. Come and enjoy a long or short stay in our gites.